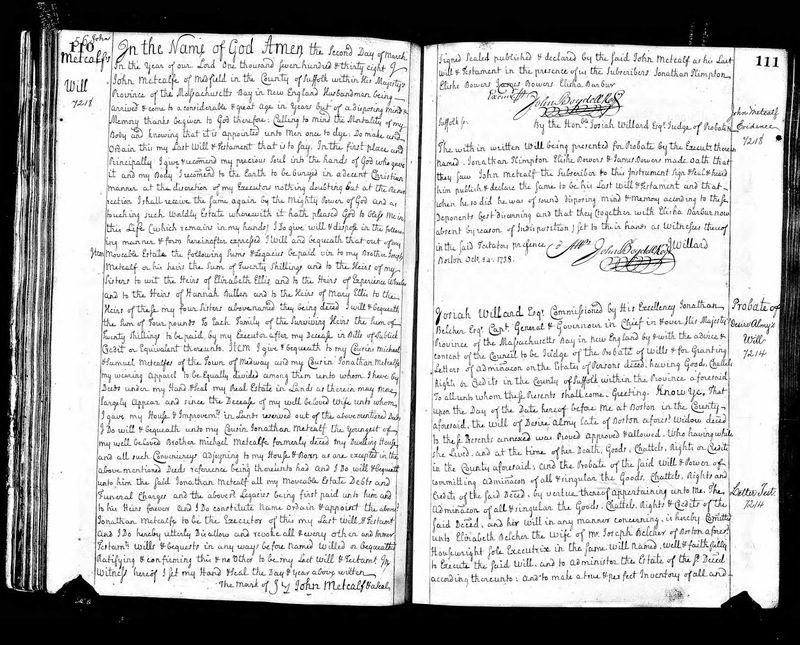 Genea-Musings: Amanuensis Monday - 1738 Will of John Metcalf (1648-1738) of Medfield, Mass. Amanuensis Monday - 1738 Will of John Metcalf (1648-1738) of Medfield, Mass. bandman dece^d, to these Presents annexed, was Proved approved & allowed. of Probate. Dated at Boston the Twenty fourth Day of October Anno Dom^i 1738. Witness hereof I Set my Hand & Seal the Day & Year above written. Elisha Bowers James Bowers Elisha Barbur. images, Ancestry.com (http://www.ancestry.com : accessed 4 July 2016), Suffolk County > Probate Records, Vol. 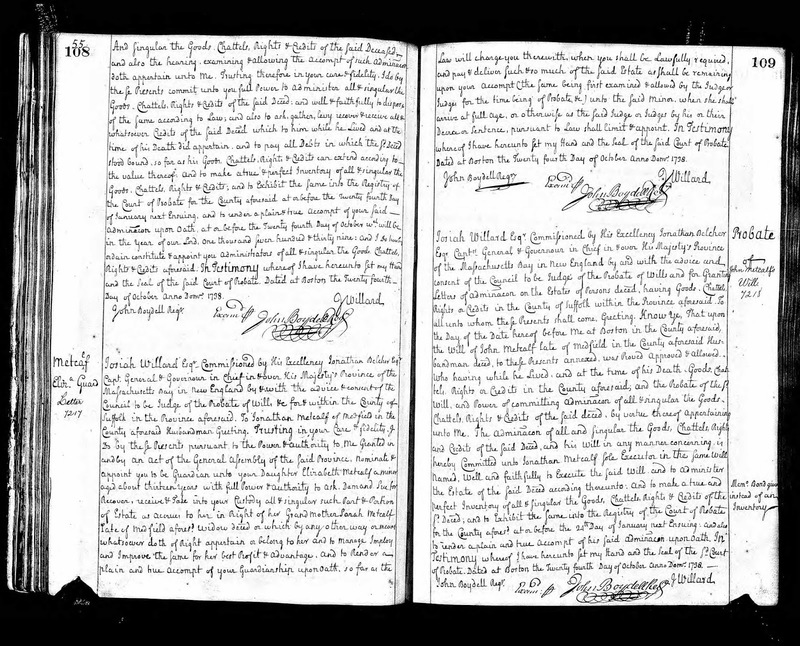 32-34, 1734-1739: Volume 34, pages 109-111 (images 664-665 of 938), 1738 Letter testamentary, will and evidence for estate of John Metcalfe; Original data from Suffolk County [Mass.] Probate Court clerk books. John Metcalf (1648-1738) had two wives. He married his first wife, Mary Bowers (1648-1707), in 1676, and they had three children, one died in infancy and the other two died in 1707 in the same month that their mother died. They did not marry or have children. John Metcalf married his second wife, Sarah (Turner) Plimpton (1663-1738) in 1708. They had no children together, but Sarah had two Plimpton children from her first marriage, but one of them died as a child. The other child, Elizabeth Plimpton (1702-1725) married Jonathan Metcalf (1690-1758) in 1719, and they had three children. Jonathan Metcalf married twice more. 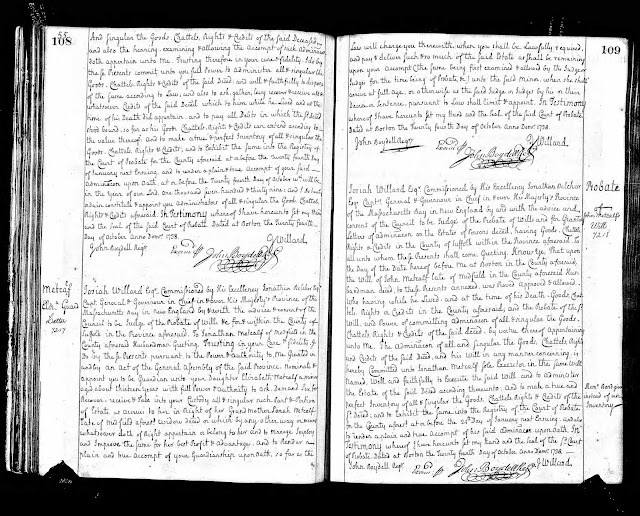 In the will of John Metcalf (1648-1738), he names his heirs as the heirs of his brother, Joseph Metcalf ((1658-1741), the heirs of his deceased sister Elizabeth (Metcalf) Ellis (1654-1735), the heirs of his deceased sister Experience (Metcalf) Wheeler (1661-1730), the heirs of his deceased sister Hannah (Metcalf) Bullen (1664-1719), the heirs of his deceased sister Mary (Metcalf) Ellis (1668-1727), and the heirs of his deceased brother Michael Metcalf (1650-1691), naming them as "cousins" Michael, Samuel and Jonathan Metcalf. He named his "cousin" (actually his nephew) Jonathan Metcalf as his executor, and left all of his real property and moveables to Jonathan Metcalf, who was to pay the legacies to the other heirs. This Jonathan Metcalf (1690-1758) was the one who married his step-cousin, Elizabeth Plimpton, in 1719. John Metcalf (1648-1738), Michael Metcalf (1650-1691), Elizabeth (Metcalf) Ellis (1654-1735), Experience (Metcalf) Wheeler (1661-1730), Joseph Metcalf (1658-1741), Hannah (Metcalf) Bullen (1664-1719) and Mary (Metcalf) Ellis (1668-1727) were all children of John Metcalf (1622-1690) and Mary Chickering (168-1698), who married in 1647 in Dedham, and resided in Medfield, Massachusetts. This will names all of the known children of John and Mary (Chickering) Metcalf, and three sons of John Metcalf's brother, Michael Metcalf (1650-1691).. This is a probate record of a man who married twice, had three children who died before he died and had no children, and whose two wives died before he died. Having no heirs, his will bequeathed money and property to the heirs of his six siblings. One of them, Jonathan Metcalf (1690-1758) had married the daughter of John Metcalf's second wife. So in this will, he is essentially providing for the only living heir of his two wives. I still need to search the Suffolk County, Massachusetts probate court index books for the inventory and account, and any other papers, for the estate of John Metcalf (1648-1738). John Metcalf (1648-1738) is not my ancestor; his parents are my 9th great-grandparents, his brother Michael Metcalf and his wife Elizabeth Bowers (1654-1724) are my 8th great-grandparents, and his nephew Michael Metcalf (1680-1761) and his wife Lydia White (1686-????) are my 7th great-grandparents through their son, Michael Metcalf (1706-1771), who married Melatiah Hamant (1704-1751). It was fun untangling this puzzle.